Among the essays that I’ve written for this site, one of my favorites also happens to frustrate me the most. To this day I have my doubts that my 2011 entry “The 'Shawshank' Greatness” achieved what it set out to do in the first place: identify the reasons why a film like “The Shawshank Redemption," a low-key box office failure, could ever occupy the #1 spot in the IMDb Top 250 (and remain there since I wrote it five years ago). Perhaps I treated the piece too much like a regular movie review, and instead of focusing on exalting its virtues and nitpicking its faults, I should have searched for a deeper explanation. Sure, the more I watch the film, the more flaws I find in it. For instance, after Andy Dufresne (Tim Robbins) destroys a drainage pipe with a rock and the contents burst out, an interior shot reveals it wasn’t even a quarter full. Let’s also not forget how Andy seems to lose all of the gray hair and the elder complexion he acquired in his 20-year prison stint as soon as he arrives in Zihuatanejo. These and the other goofs mentioned in my previous article are mostly cinematic cheats designed to enhance the drama or justify the impossible. But director Frank Darabont’s picture generates such goodwill, they don’t really end up mattering all that much. This has to be one of "The Shawshank Redemption"'s most peculiar attributes. After all, shouldn’t one of the beloved movies of all time tend to be on the flawless side? Not only is Darabont's film far from perfect but if you judge it on the surface, it doesn’t even seem particularly original. A recent showing on TCM's “Escape Movie Month” paired it alongside Don Siegel’s “Escape with Alcatraz," bringing forward an astounding number of similarities: the inmate who’s forced to walk naked through the main hall upon his night arrival, the personal (an totally unnecessary) welcome by the warden, the breakfast where he’s greeted by one of the inmates and his pet, the communal shower scene where he is pursued by a scary pervert, his unfair punishment in "the hole," the obligatory kindly prison veteran who befriends him, the digging of a tunnel which contents are progressively emptied in the patio, the painstaking escape, etc. These resemblances are striking but also understandable; there are only so many things that can happen to a character in prison. Besides, there is a world of difference between both films’ philosophies and goals; “Escape from Alcatraz” is an acceptable Eastwood vehicle that aims to create some suspense, while “The Shawshank Redemption” represents a sort of microcosm for the defining moments in every life. 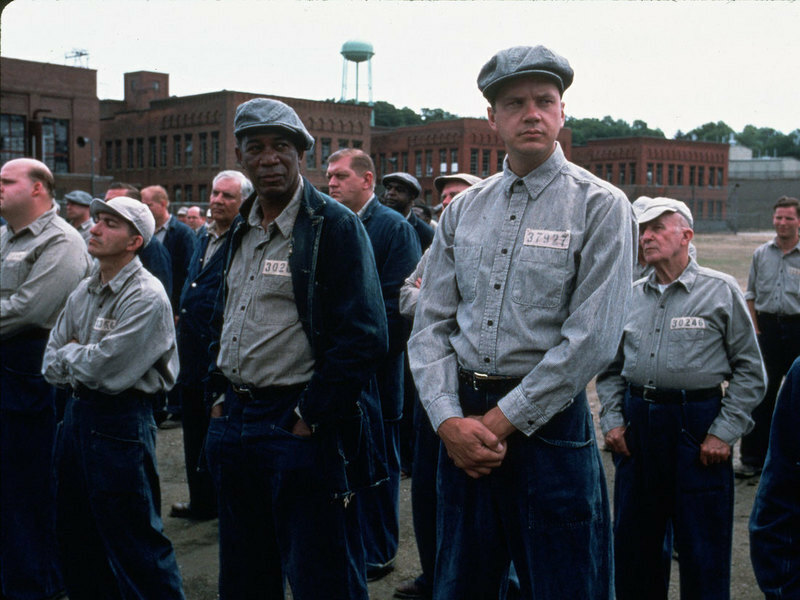 Another of "The Shawshank Redemption'"s unusual traits is its structure gives it a tremendous re-watchability factor. There are several scenes that play completely different on repeated viewings and provide additional instances of suspense, regardless of how aware you are of their outcome. Take for instance the sequence in Andy Dufresne’s cell where an oblivious Warden Norton holds the book that houses the very tool that’ll set him free, while standing alongside the poster he’s using to hide his escape route. There’s also the scene where, unknowing to the audience, he walks alongside several guards while wearing the warden’s stolen shoes. These moments reveal an alternate, hidden mindset on the part of Andy that plays even better the second time around. They add to the progressive revelations of his unexpected virtues, one of the most fun aspects of the movie, such as his second-to-none persistence and his ability to fit in with his less educated fellow prisoners and guards (think of how he’s able to make them all happy by getting the former to buy the free “bohemian style icy cold beers” for the latter). “The Shawshank Redemption” also benefited tremendously from being filmed inside a real location that has its own marvelous character, the kind of place that nightmares are made of (and that’s only half the story). If you visit the Mansfield Prison where the movie was shot you come away stunned at realizing that Warden Norton’s definition of the (fake) cellblock used for the movie as a "one bunk Hilton" wasn’t far-off. Not only is the real jailhouse much more terrifying (it can be seen during the Elmo Blatch monologue which supposedly takes place in a different prison) but the cells are about half the size and they fit two people instead of one. Obviously Darabont had to modify this arrangement as to justify why nobody had been aware of Andy’s digging. Comparing “The Shawshank Redemption” with Alan Parker’s “Midnight Express” can also help explain some of its less obvious strengths. This prison-themed entry would seem to have much in common with our film, especially those lasting images at the end on the euphoria of long sought freedom, but their aftermaths have a completely different feel. On their recent TV showings I found myself breezing through “The Shawshank Redemption” as always but I bailed out on “Midnight Express” halfway through; I find that it progressively digs the audience into an emotional hole that’s not easy to leave once it ends, no matter how happy a conclusion it provides. This is probably because Parker chose to depict character Billy Hayes’ breakout as an act of sheer luck rather than the result of any given attitude or achievement on his part. Hayes’ journey is merely about the discovery of the darker side of human nature and this key difference holds my first explanation for Shawshank’s great appeal. Even though Andy Dufresne is by no means perfect, his quest is a reflection of humanity’s highest highs and the contrast with his own horrible surroundings only serve to make them more evident. This is how Darabont was able to turn such scenes as that about a group of mostly unappealing criminals achieving imaginary freedom by way of Mozart, into something emotionally powerful. The one film that “The Shawshank Redemption” actually reminds me the most is Frank Capra’s "It’s a Wonderful Life," another box office failure with a good deal of warts (think of Donna Reed’s alternate bachelorette future) that would seem to have nothing in common with it but heir essence is basically the same, regardless of how different their settings. Both are really about the redeeming journey of a character (James Stewart's George Bailey/Morgan Freeman's Red) that started long before he came to lose his faith. Just before the two movies reach their payoffs (George Bailey’s acquaintances singing "Auld Lang Syne” and Andy Dufresene lifting his arms in elation) their directors have already spent a good deal of time planting the seeds of doubt and resignation in their audience, resorting to their more practical/ pessimistic sides from the perspective of the beloved Stewart and Freeman characters. And yet, the viewer becomes endeared with the Robbins' Andy just the same because no matter how remote or quiet, he’s the only one who never subdues to the warden’s will or accepts his own ill-fate. After witnessing his initial torment at the hands of the “sisters,” anyone would be resigned to see him in his later semi-acceptable life, protected by the guards and searching for meaning in whatever projects come along. But at every critical instance he does the opposite of what the audience expects, and in doing so he leaves them in disbelief over being reminded of life’s unimagined possibilities. Think of how he goes all out during his escape, burning any bridges that would have made it possible for him to go back to his cell unnoticed, had any part of his plan gone wrong. This makes it one of the great cinematic twists, coming up late in the picture just when it seemed like Andy had just hit rock bottom in what never even felt to me like an escape flick until after such happened. It also represents another explanation for the film’s standing in the IMDb standings: What movies other than these two have been able to take their audience from a state of dismay to ecstasy in the blink of an eye, with the same impact of a load of bricks, viewing after viewing? I always associate “The Shawshank Redemption” with two of the other Best Picture nominees from its same year simply because of how difficult it was to choose from among three definite classics. Looking back I would have to concede that Darabont's film is probably not as wholly original as “Forrest Gump” nor as groundbreaking as “Pulp Fiction,” but I still like it the best of the three; I find pessimist Red’s and distant Andy’s journey more relevant and relatable than those of Jules/Vincent or Forrest/Bubba/Jenny. From the above arguments we can conclude that every movie represents more than the sum of any particular settings, characters or even the circumstances that surround them. Of greater relevance are their protagonists’ natures, attitudes and goals. Whatever the reasons why “The Shawshank Redemption” is so beloved, its biggest achievement may well be demonstrating that the combination of a heinous environment an obscure protagonist and repealing enemies can amount to something sublime. Next Article: Familiar and Foreign: On Andrew Ahn's "Spa Night" Previous Article: Memoirs of a Geisha, Part II: How Are Geisha or Nerd Stereotypes Harmful?